A quick summary: Goldy Luck's mom hands her a plate of turnip cakes and tells her to take them to her neighbors, the Chans. When no one answers the door, Goldy gives the door a little push, and tumbles inside, dropping her turnip cakes everywhere. When she wanders into the kitchen to find a broom, she spies three steaming bowls of congee. I'm sure you know where it goes from here... she also ends up in the living room, where she breaks Little Chan's rocking chair, and ultimately ends up in Little Chan's bed, fast asleep. When the panda family arrives home, they see that their house is in disarray, and they find Goldy asleep in Little Chan's bed. Goldy wakes up and runs from the house. BUT... it doesn't stop there. Goldy begins to feel guilty and returns to the Chans' apartment, where she apologizes and helps to clean up the mess she made. The story ends with Goldy and Little Chan making a new batch of turnip cakes, and Goldy being given a red envelope (which is a traditional Chinese New Year custom). I LOVE THIS BOOK for so many reasons!! First, the author weaves countless Chinese New Year customs and traditions into this story. Second, it's soooooooo fun to read! Check out this line: "She plunked down on Mr. Chan's massage chair. Something hard steamrollered up and down her back. 'Ouch!' she cried, springing to her feet. 'Too rough.' " Third, I appreciate how the author creates an alternate ending to the traditional tale, and has Goldy return to take responsibility for her actions. Fourth, the illustrations by Grace Zong are terrific! Finally, this book includes some extras, like a page of facts about Chinese New Year and a turnip cake recipe. To begin, I'll ask students to raise their hand if they have ever heard the story of Goldilocks and the Three Bears. The majority of students will likely raise their hands, but there may be a few newly-arrived ELLs who are not familiar with the story. I'll instruct them to turn to a neighbor and work together to summarize the classic tale (and I'll remind them to use the summarizing fiction skills that we've learned earlier in the year)! After allowing time for the partner discussion, I'll show my students Goldy Luck and the Three Pandas, and explain that I will be reading this story, which is a spin-off of Goldilocks and the Three Bears. 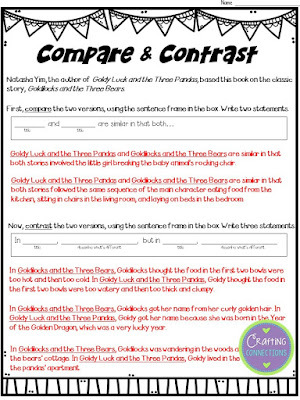 While I am reading, it will be their job to listen closely and notice similarities and differences between this Goldy Luck version and the original Goldilocks story. On the first worksheet, students write two comparing sentences and three contrasting sentences based on the Venn diagram that we just created. 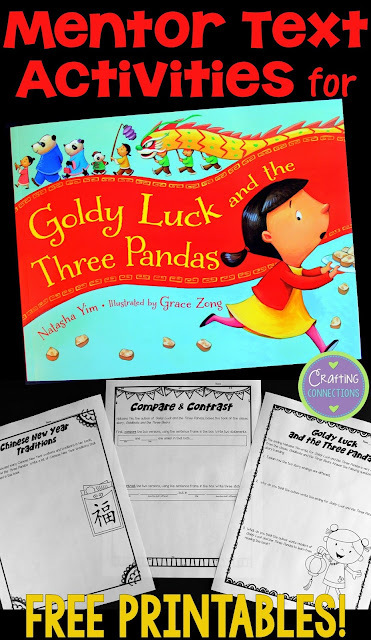 On the second worksheet, students zoom in on the ending of Goldy Luck and the Three Pandas. They are asked to consider the author's purpose for changing it so significantly. 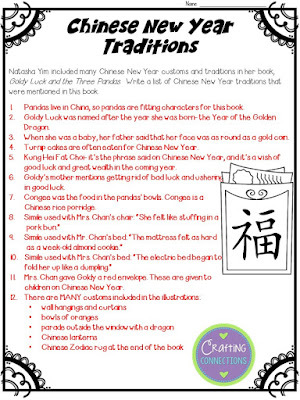 On the third worksheet, students compile a list of ways that the author added bits of Chinese culture into the story. I plan to read the book aloud a second time (I doubt I'll hear any complaints!! ), and have students create this list while they are listening to the story a second time. To download these three worksheets, just click on any of the three worksheet images shown above. Thanks for stopping by! 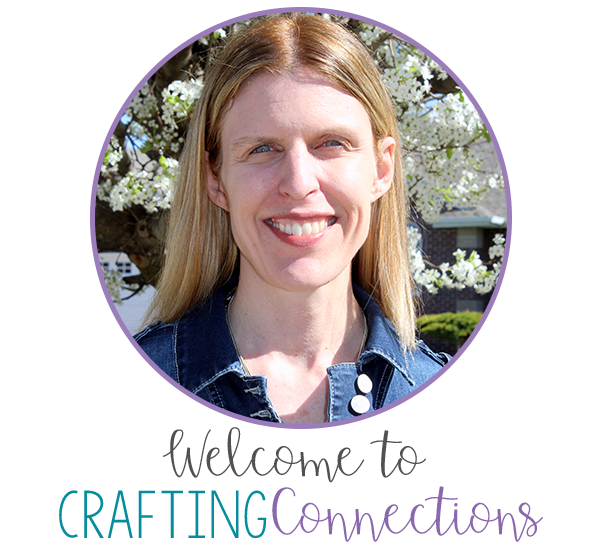 Also, be sure to hop around to my friends' blogs and check out the other books shared in this linkup! Thank you, Deb, for this great book recommendation and the free activities. I LOVE Chinese New Year! Happy New Year to you as well! What a fun looking book! I love different versions of fairy tales, especially when they weave culture into them. Thanks so much for sharing! I look forward to checking out this book! Thanks for the introduction. Happy New Year.